In 1991, my 9-year-old daughter Rachel traveled with me to Guatemala where we were struck by the heartbreaking rural poverty and mudslides worsened by widespread deforestation. We vividly remember holding a three-year-old child who was so listless and malnourished he could scarcely lift his arms. The worry and fatigue on his mother's face and the child's condition affected us both profoundly, despite Rachel's relative youth. 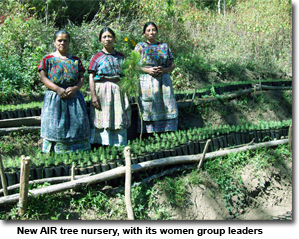 This experience led us to found the Alliance for International Reforestation (AIR). Since 1993 we have worked to establish programs to teach local communities how to make a living from the land without destroying life-sustaining forests. To do this, we plant trees together with crops, a practice called "agro-forestry." Through our years of work, we have found that around 70 percent of the indigenous volunteers on our projects have been from a group that is often overlooked: local women farmers. Working side by side with them to carefully plant tree seedlings in their fields, we have learned that these women know best the value trees provide because they are the ones who hunt for firewood each day. One "miracle tree" we often use in our projects, the aliso tree, has nitrogen-fixing roots that fertilize the crops and high-protein leaves that feed cows and pigs. It grows at an incredible eight inches per month and can also be topped off for firewood without killing the tree. In addition to environmental benefits, programs such as these help promote leadership and individual success. 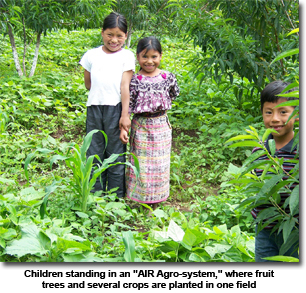 For example, the executive director of AIR for the past 11 years came to us from Chimaltenango, Guatemala. Cecilia Ramirez began working with us only as a part-time secretary, however, her love of and commitment to her country, as well as her extraordinary organizational skills led to her appointment as director in 1999. Another associate, Dona Maria de Jesus Colaj Chali, won an award from the Swiss Foundation for Rural Women for her leadership in 2000. The farmers we partner with have revealed countless interconnections found in conservation work. Planting trees helps improve nutrition, affords children more time to attend school, safeguards rainforests from encroachment, helps prevent mudslides, provides animal habitat, sequesters carbon from the atmosphere, protects water springs, and much more. We have also seen how women's direct involvement in reforestation projects and other environmental activism is connected to the "care work" that they have performed within the household for millennia. And these local efforts pay off globally, in a huge way. Last year, a bipartisan group in Congress came together to introduce a bill called the Global Conservation Act. This proposal would revolutionize our country's efforts to help preserve the world's remaining natural ecosystems for wildlife species and for the many indigenous communities that depend on them. One particularly significant component of the legislation addresses the social dimensions of conservation by reaching out to the people who are most adversely impacted by environmental degradation, like women. This can produce long-lasting results. We saw this first-hand in 2008 during an exciting return visit to one of our first project sites, the Guatemalan community of Pachay Las Lomas. The trees AIR and the town's residents planted in 1994 had become a beautiful forest. One young woman showing us around looked familiar; we later realized that we had snapped a picture of her in the tree nursery with her mother in 1994, when she was a little girl. Today, she is a young mother herself, with a tree nursery of her own. And she still uses the same skills AIR first taught to her mother, who had, in turn, passed them on to her. The Global Conservation Act truly is an important measure for which the time has come. Finding ways to better recognize and incorporate women as key allies in the struggle to protect our environment and dwindling natural resources is a policy that will pay dividends, both at home and abroad, for many generations to come. We hope that all congressional legislators will support this bipartisan initiative. Anne Hallum is founder of the Alliance for International Reforestation and for her work was recently named a "CNN Hero." 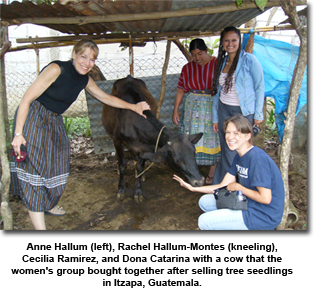 Her daughter, Rachel Hallum-Montes has been planting trees with her mother since the age of 12 and she is now a sociologist.